The “Muddy Angel Run” is Europe’s 5 kilometer Mud Run for women of all fitness levels who want to do good while having fun. Whether running, jogging or walking. Whether young or old, whether a small or large donation: connect with other angels from your friends, colleagues, and family. Get your sisters, your mother, daughters, neighbors, colleagues in your team to have fun and do good! Worldwide over one million women have participated in Mud Runs against breast cancer. With your participation in the Muddy Angel Run you support this movement and become part of a unique community. The ticket price varies between 29-49 euros* per participant. The ticket price will increase usually at the end of each month. Book early, save money and help us to plan. Furthermore, we want to use our events to create more awareness for the fight against breast cancer. Read more about what we do here. Besides the direct measures we can support with our events and within the Muddy Angel Community, we donate 1€ of each ticket to charities who focus their efforts on the fight against breast cancer. Additionally, we give you the option to donate any additional amount of money as part of your registration. 100% of these donations will be forwarded to the associations. If you want to start for free, you can help us as a volunteer in exchange. There are options to help as a volunteer on the days before the event (setting up), during event (check in or course) and after the event. Find out all about the volunteer options here. The Event Overview shows you valid prices for each event and for how long they are applied. *Prices are per person, there is a fee for online processing. There are no team prices. What awaits you at a Muddy Angel Run event? After arriving, there will be a check-in area where you will be officially registered and receive your pink headband. At our guarded wardrobe tent, you can deposit one small sport bag. (We assume no liability for valuables). In the Base Area there will be food and drinks, to enjoy the day with us. Moreover, there will be photographers taking team photos in the base area and on the course. It is an external service and you can buy the pictures after the events directly from the photographer service. Before you start, there will be a warm up session with professional trainers. The first starting wave is at 10am the next one starts 30 minutes later. You will be assigned to a start time and go on the track with 250-300 other Muddy Angels. This way we ensure that the course and the obstacles are not overcrowded. On the track you will face LOTS of mud, water, amusing obstacles, and lots of fun. While running, jogging or walking you will be supplied with water. At the finish line a snack and other drinks are waiting for you. To get rid of the mud you can make use of the cold showers in the finish area. You want to participate with your daughter or little sister? The minimum participation age is 12 years accompanied by an adult. From 16-18 years you only need the consent of a parent or guardian. Cancer fights dirty – so can we! Together with all Muddy Angels we support initiatives that increase awareness against breast cancer. Our motto is “Doing good while getting dirty”. We take pride in having reached over 10,000,000 women with our campaigns to spread these messages and get the conversation going. And we are excited having motivated over 100,000 women and girls to join a Muddy Angel Run and start a fitness routine. Some Muddy Angels do not run for themselves, but to morally support a dear one who is or was battling against breast cancer. For Angels that have overcome cancer, we provide one of 50 free entries per event. If you have defeated breast cancer or are still fighting against it, just send us a short message to help@muddyangelrun.com and we will send you all the information regarding free participation. By participating you set a mark against breast cancer. The more angels start, the clearer the message. 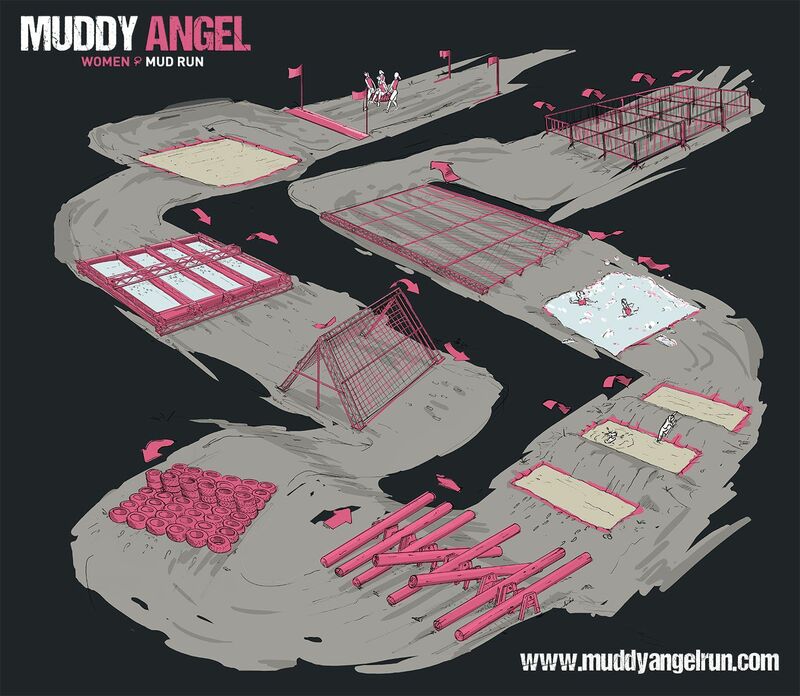 We are looking forward to seeing many Muddy Angels! We can do a lot but not everything. Thats why we partner up with charity organizations. We donate 1 € of your ticket price to these partners to support local activities and research against breast cancer. If you also want to help financially, you can donate any additional amount when purchasing your ticket through our platform. 100% of your donation will be directly given to one of our charity partners. More information about your work as a volunteer and about your free ticket you can find here.